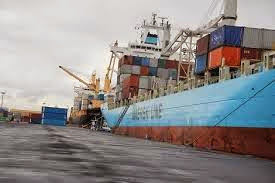 The Nigerian Ports recorded a cargo throughput, including crude oil shipment, of 49,304,407 million metric tonnes, showing an increase of 7.20 per cent over 45,994,755 metric tonnes achieved within the same period of 2014, the Nigerian Ports Authority(NPA) has said. A breakdown of cargo throughput showed that general Cargo was 6, 469,022 metric tons, an increase of 6.10 per cent over 6,097,318 metric tons in the same period of 2014 while Dry Bulk Cargo stood at 2,276,358 metric tonnes. In a statement signed by the General Manager, Public Affairs, NPA, Capt. Iheanacho Ebubeogu, showed that Liquefied Natural Gas (LNG) shipment was 5,545,946 metric tons showing a Growth of 0.37 per cent over 5,525,494 metric tons figure of 2014. Refined Petroleum products stood at 4,300,852 metric tonnes, a drop of 6.77 per cent from 2014 figure of 4,613,567 metric tones while Laden Container that passed through all ports amounted to 233,331TEUs. Similarly, empty Container stood at 163,850TEUs while a total of 30,649 units of vehicles were handled in the period under review. The statement also said that in the first quarter of 2015, the total of 5,139 oceans going vessels with a total Gross Tonnage (GT) of 61,990,999 called at Nigerian Ports compared with the GT of 57,034,338 GT recorded in 2014. The statement added, “The Gross tonnage of Crude Oil Tankers recorded in the period under showed a 12.21 per cent increase over 1st Quarter of 2014. “In the period under review, Lagos Port Complex (LPC) recorded a Gross registered tonnage of 9,298,761, showing an increase of 10.6 per cent over 8,407,233 gross tons achieved in 2014. A total of 372 vessels were handled in the period under review. “Tin can Island Port recorded a Gross tonnage of 12,232,575, indicating an increase of 8.15 per cent over 11,310,751 gross tons recorded in the corresponding period of 2014. A total number of 435 ocean going vessels were handled within the period. “Calabar Port complex recorded a total GT of 958,288 showing a rise of 11.67 per cent over 858,174 gross tons of 2014, leaving the port with 100 Ocean going vessels in the period under review. “Rivers Port complex recorded a total Gross tonnage of 1,475,864, indicating 14.45 per cent increase over 1,288,524 gross tons achieved in the corresponding period of 2014. A total of 132 ocean going vessels were handled within the period under review. “Onne Port complex recorded a GT of 12,768,834, reflecting an increase of 12.99 per cent over 11,300,433 gross tons recorded in the corresponding period of 2014 with 1,025 vessels handled within the period. “Delta Port Complex recorded 1,643,346 gross tons, with 2,816 vessels handled. “Generally in 1st quarter 2015, the level of operational activities at the port locations witnessed positive variance over the 1st Quarter 2014. A positive growth of 4.17 per cent (104.2% performance) was achieved over 35,023,619 GT forecasted in 1st Quarter 2015 Budgets. Reacting to the good result, the Managing Director, Mallam Habib Abdullahi said that the ports had a very strong first quarter. Abdullahi attributed the performance to continued attention paid to first and foremost, improving of existing port infrastructures in the areas of rehabilitation of port quay walls and aprons, and secondly, to the deepening of the water channels. He also mentioned the upgrading and renovation of the common user facilities, wrecks removal from the channels as well as other necessary engineering and marine works to ensure the efficiency of service delivery and meeting the expectation of the stakeholders and numerous ports users as success factors. He believes that with the current re-positioning being introduced by the Federal Government under president Muhammed Buhari ,the ports will witness further improvements. Meanwhile, the NPA said it had embarked on palliative measures on the port access roads in collaboration with FERMA, in a bid to avoid the gridlock that had affected smooth evacuation of cargo from the Ports. The NPA said it had remained focused in making its ports efficient and customer friendly. “This resolve has seen the Authority take giant stride to our journey to establish a full complement of port community system (PCS) through integrated information flows of logistic process by the introduction of Electronic Ship Entry Notice (e-SEN) which has been integrated on an online payment platform, Electronic payment, oracle financials, Oracle HR as major initiatives that will further drive with great speed the wheel of shipping in our ports. "This is to simplify the payment processes to NPA and enhance the provision of a link to the world economy thereby encouraging international trade”, the statement read.